Mitsu is Kanaria's medium. She loves dolls to the point of obsession, which shows in both her room's decor and her frequent doting on Kanaria; she has shelves upon shelves crammed full of dolls, and makes frequent trips to the doll shop to purchase gifts for Kanaria. Although her work attire is that of an office lady, she is introduced as a professional photographer by Kanaria to the other dolls. 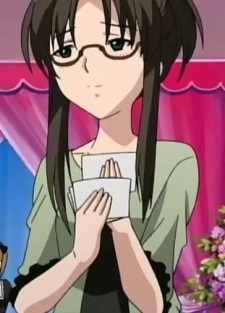 In the manga, Micchan reveals that she has quit her old, comfortable job and becomes a pattern make for doll's dresses, selling her products on her personal website called "Angels Cage", despite the increased workload and the minor success. Micchan is generally regarded as being just as harmless and eccentric as Kanaria. She only appears in Rozen Maiden Träumend and the manga. In the manga, she has freckles, whereas her anime counterpart lacks this trait. She never actually meets Jun in the anime, but in the manga, Kanaria brings her to the Sakurada residence, where Micchan shortly after nicknames Jun as "Junjun." She recognizes Jun's natural talent in designing and making dresses and offered a form of partnership, though Jun refuses.